This is a steep wooded glen of the Caaf Water (a tributary of the River Garnock), just south of Dalry on the minor road from the A737 to Saltcoats (NS 287 487). The path is rough and steep in places, requiring care and good footwear. A circular 1km route is possible using a footbridge over the Caaf. 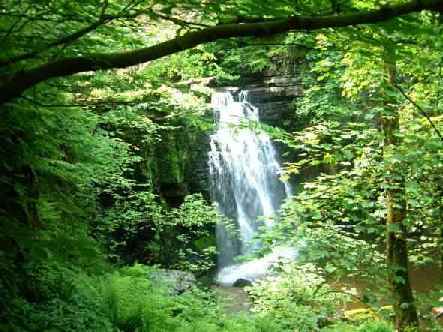 Lynn Falls is a local beauty spot, particularly attractive in spring for its wild flowers. There is a car park just west of the road bridge: from the A737 turn onto the Saltcoats road; just before the bridge turn right into a lane with car park beside the river. Walk along the lane past the houses to the start of the path to the glen. The circular path comes back out on the Saltcoats road about 100m up the hill from the river bridge. Take care here as the road is busy with poor visibility. There are narrow “kissing gates” along the path. There is a regular bus service along the A737, and Dalry rail station is just over 1km away. Woodland species abound in Spring including Chiffchaff, Blackcap, Garden Warbler, Spotted Flycatcher, Tawny Owl, Sparrowhawk and Buzzard . The burn attracts Grey and Pied Wagtail, Dipper and the occasional Kingfisher . The area has considerable geological, historical and industrial archaeological interest including Fossil Johnny, Peden’s Point, and a gunpowder mill. Lynn House was the abode of George Houston RSA. This entry was posted in Locations - North Ayrshire on 08-Jun-2003 .